Thank you to everyone who attended last nights AGM. We saw a good turn out with approximately 40 attendees & plenty of discussion. as Snowboard Instructor & Trainee Ski Instructor & Adaptive helper. Thanks to everyone who took the time to nominate for the Ivan Palfrey award, both on-line & via reception. Winner of the adult award is Instructor Kevin Rhead. 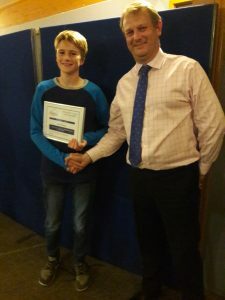 Joseph receiving his certificate from Chair, Richard Oliver.